It's about time I blow the dust off the old computer and rejoin the blogging world! Thank you for your patience as I entered the oh-so-scary mommy world. What a crazy 4 months it has been. Lots of ups-and-downs...but mostly ups! Nolan is an awesome kiddo and I've loved watching him grow up so incredibly fast. Ironically, now that I've finally gotten ahold of this parenting thing, I find myself back at work during the week. Just when I think "Ok, I CAN do this..." I have to schlep back in to an office and leave him at home to entertain the nanny. Although Im sad to leave him, the good news is that I love my job. In fact, I'm happy to be back designing and I'm even happier to pick my #1 hobby (baking and eating raw cookie dough) back up! Pretty soon Nolan will be my in-house taste tester and critic. 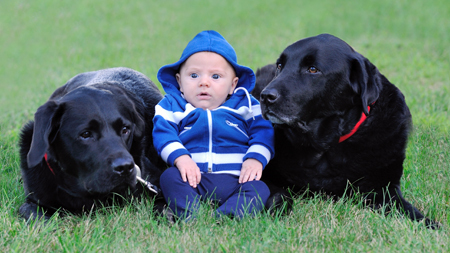 Until then, I'll continue to let my 2 dogs assist me. They LOVE everything I make, so I may keep them around to boost my ego. 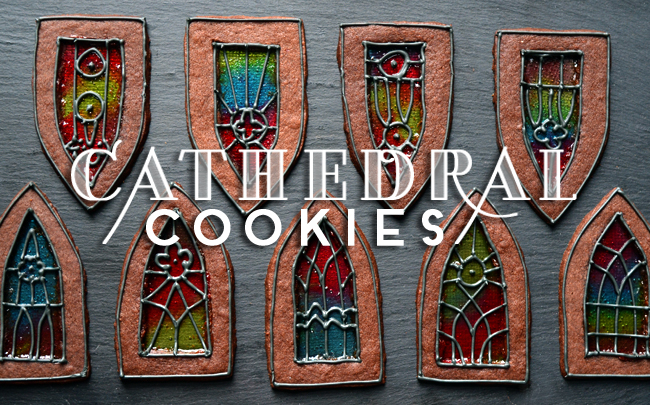 These Cathedral Cookies came about as I spent many days and nights staring out of my apartment windows. The sunsets are spectacular and the way the light enters my apartment at dusk is a real treat. 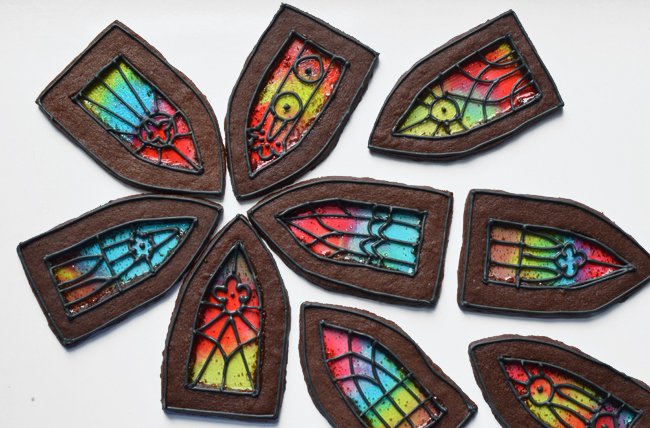 I remembered making stained glass cookies as a child and holding them up to the window to let the light shine through. 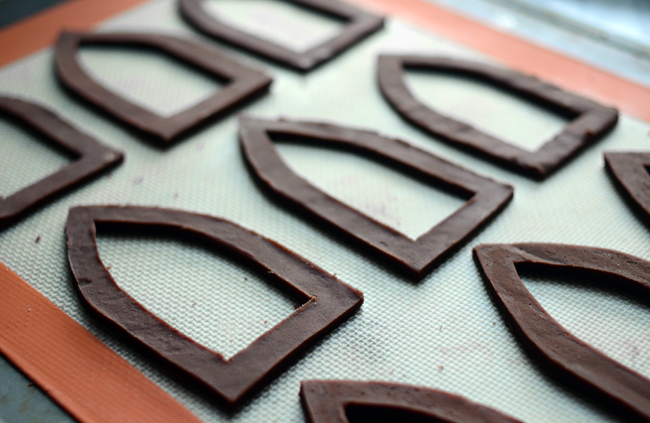 They look complicated but really are one of the simplest to make on the cookie spectrum. 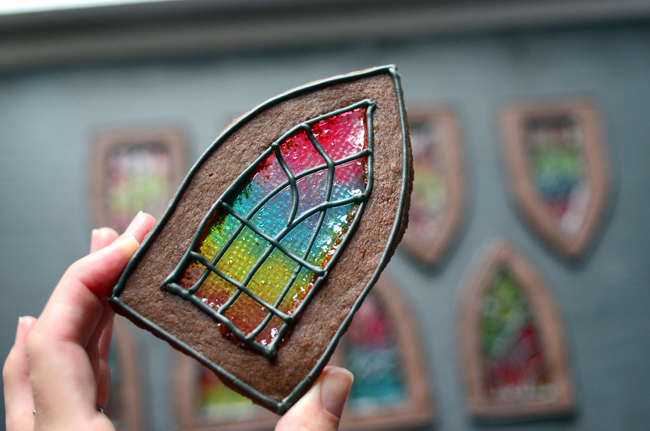 Of course, I couldn't just make a standard stained glass cookie. 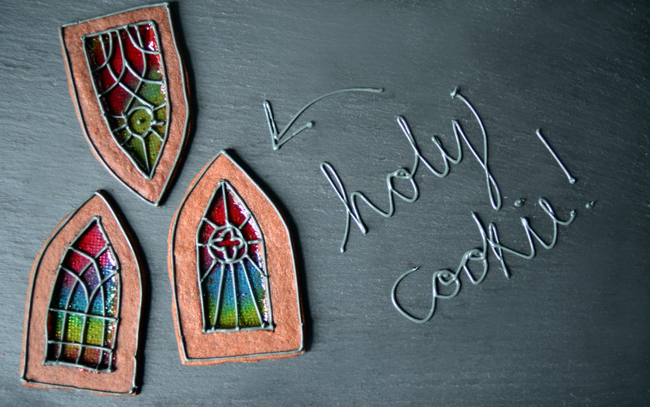 These cathedral cookies may look fancy, but they're just as easy to make as the ones from my youth. 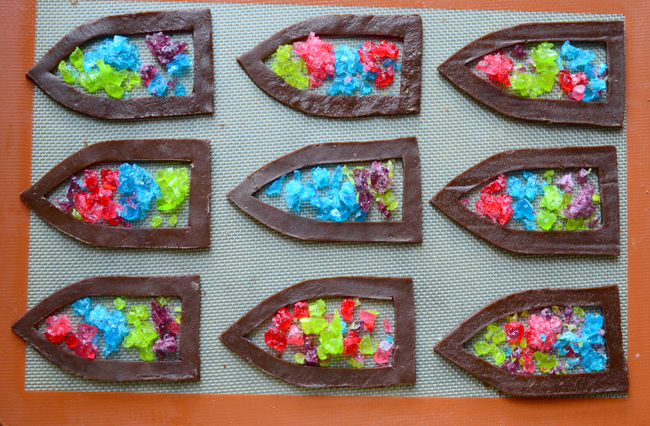 The addition of multicolored candy and royal icing mimics a cathedral stained glass window. I used a chocolate cut-out cookie but you can use any flavor of cookie dough–plain vanilla, gingerbread (great for the Holidays! ), lemon or, my personal favorite, honey-cardamom. 1. 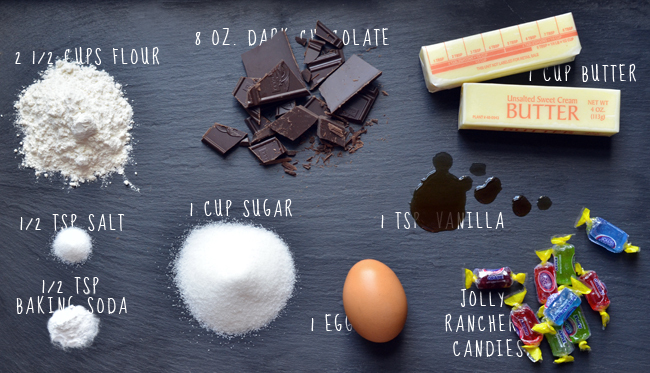 Place chocolate in a bowl and microwave on 20-second increments, stirring after each increment. Be careful not to overheat and burn the chocolate. Set aside to cool slightly. 2. 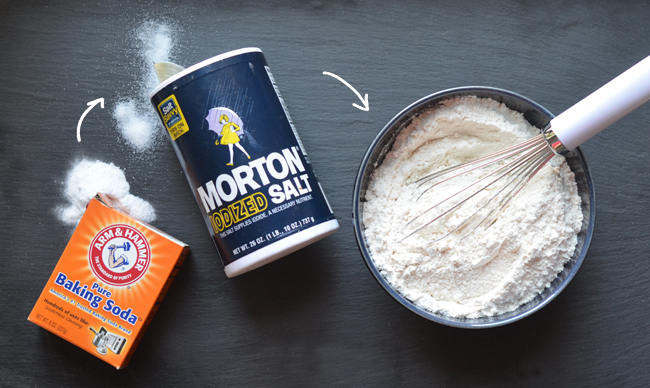 In a medium sized bowl, sift or whisk the flour, salt and baking soda. Set aside. 3. 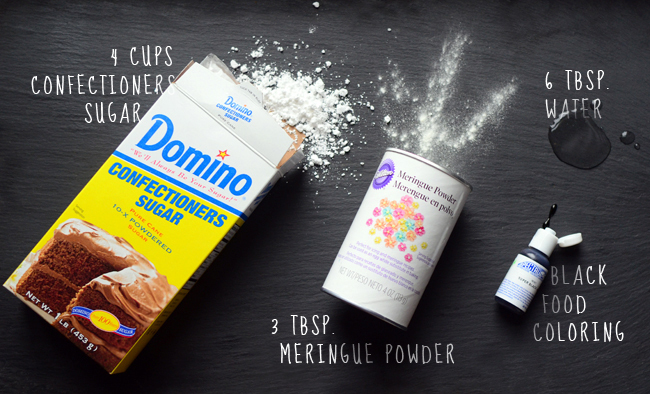 In the bowl of a standing mixer fitted with the paddle attachment, beat the butter and sugar until light and fluffy. Add the egg and vanilla and beat until combined. 4. With the mixer on low, slowly pour in the chocolate, then add the flour mix in 2 batches. Mix until the dough is just incorporated, making sure to scrape down the sides of the bowl. 5. Turn the dough out in 2 batches onto large sheets of plastic wrap or parchment paper. Wrap tightly and press into flattened disks, then refrigerate for at least an hour (or overnight). 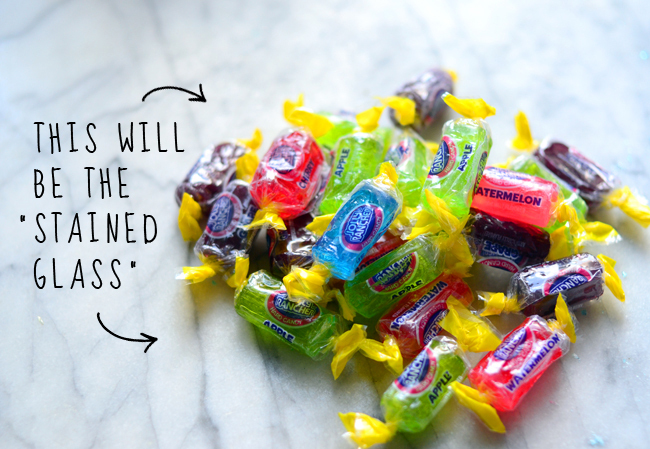 While the dough chills, unwrap the Jolly Rancher candies and place in plastic bags or dish towels according to color. Smash with a hammer until you have small pieces. 6. Preheat oven to 350 degrees. 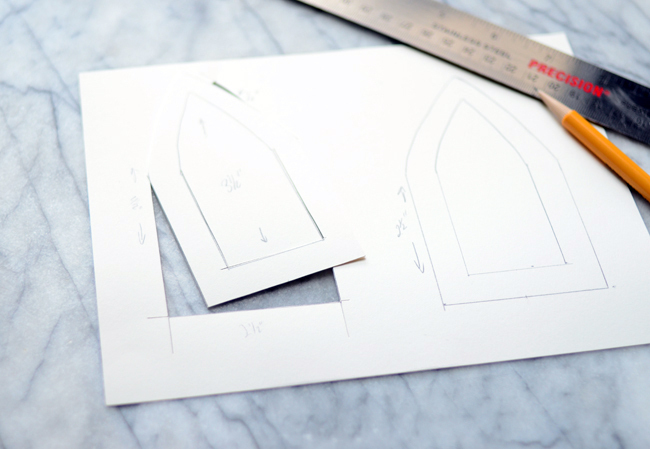 Line a baking sheet with parchment paper or a baking liner. Take one disk out of the fridge and roll out onto a floured work surface. 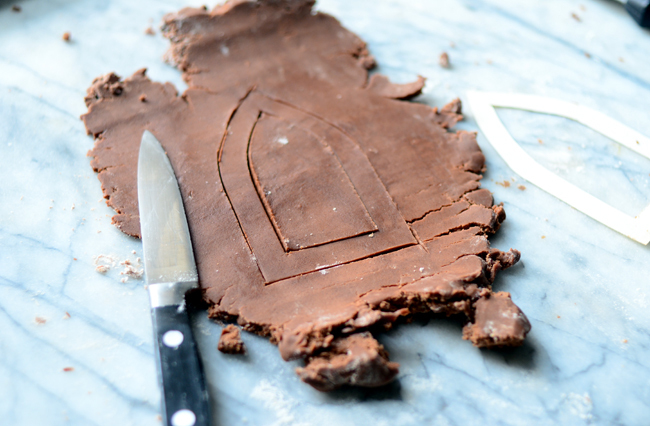 Use the window template (Download the template here) and a sharp knife to cut cathedral window frames out of the dough. Collect scraps and re-roll until you have enough window frames to fill up a baking sheet. If dough gets too soft, place in fridge to firm up. Once the baking sheet is full, place in the fridge to chill for 10 minutes. 7. 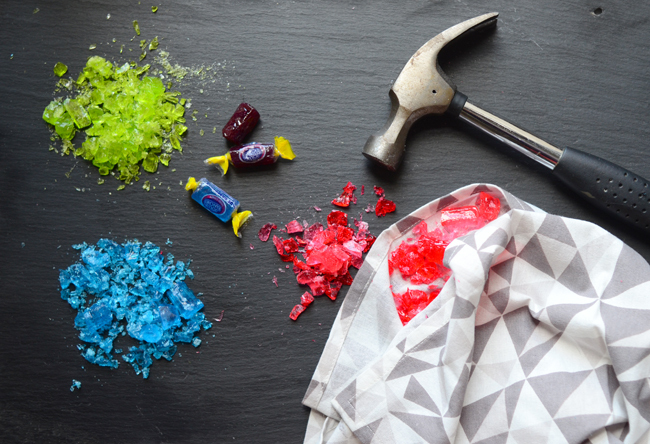 Drop a heaping teaspoon of the crushed candies into the window frames. 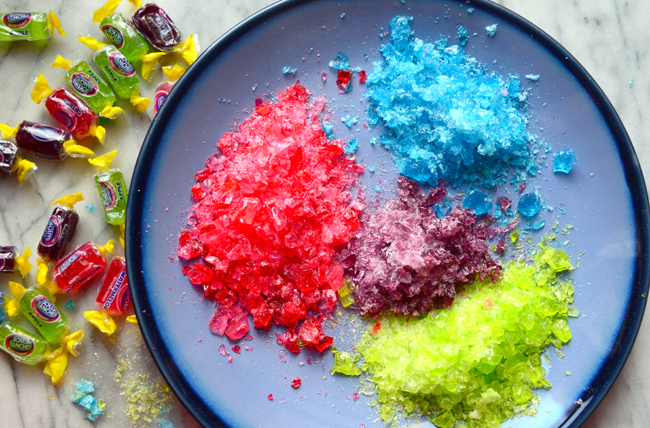 Get creative with color, but remember not to overfill or the candy will overflow when it melts. Bake on middle rack for 7-9 minutes, or until all the candy is melted and dough is slightly firm to the touch. 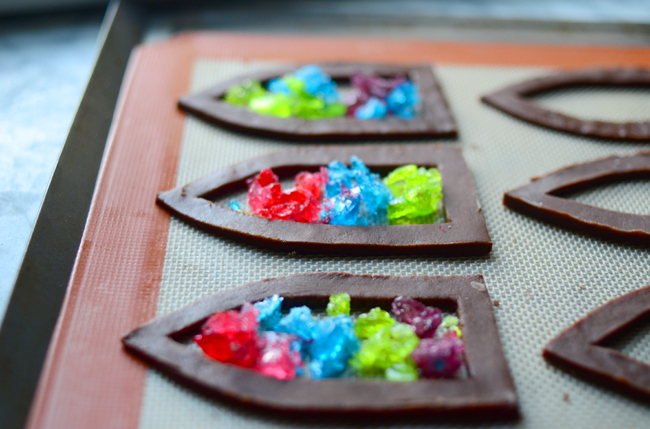 Make the royal icing while the cookies cool. Beat ingredients together until icing is shiny and soft peaks form. Add black food coloring until icing is the desired shade of grey. 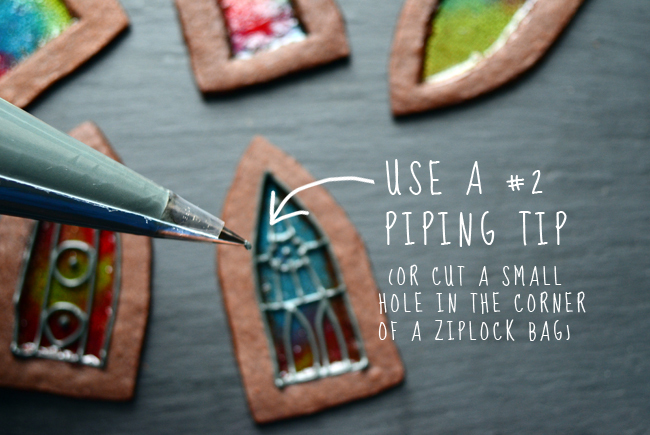 Spoon into a piping bag or ziplock bag with the tip snipped off. 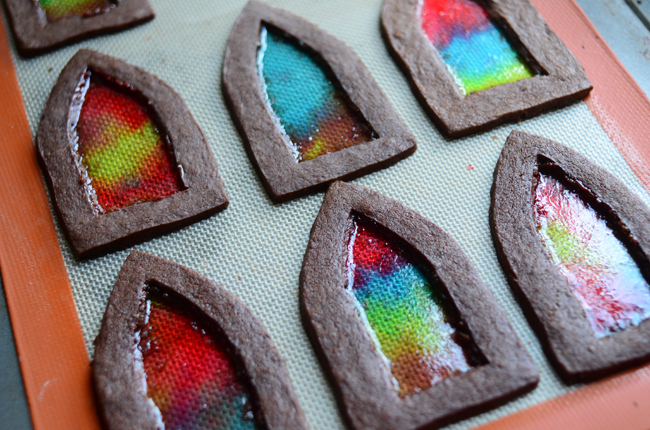 On a clean work surface pipe out stained glass details onto the cookies. I found inspiration and designs by looking up "stained glass windows" images on the internet. 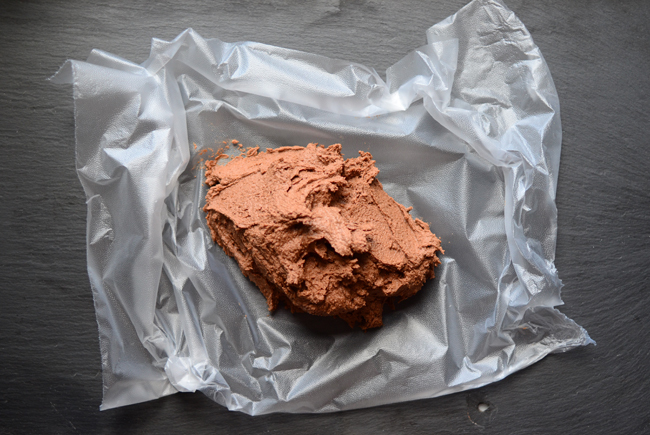 Let icing dry completely and store in an airtight container.